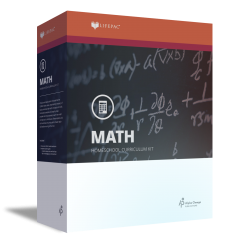 With LIFEPAC 12th Grade Math, your student is given a comprehensive study of advanced math, trigonometry, and pre-calculus. Topics are: Relations and Functions; Trigonometric Functions; Circular Functions and Graphs; Quadratic Equations; and Probability. Easy-to-understand, personalized instructions ease anxiety and give student's an assertive, positive attitude toward calculus. Packed with valuable information, this course, which covers functions and identities, is a great preparatory course for college math classes. The LIFEPAC 12th Grade Math Set contains ten worktexts and a teacher's guide (these may also be purchased individually).